Hysky - Strong against fusarium. For long storage. Early, round and hard onion. Suitable for all soil types. Heat prepared onion sets. F1 Red Ray - This is a uniform variety with an excellent skin, great flavour and is a beautiful ruby colour. Due to its strong root system this variety is very productive and is suitable for long term storage. Heat prepared onion sets. Why buy heat treated onion sets? - It's frustrating when your beautifully forming onions decide it's time to develop seed and send up a flower stalk. Heat treating is a process that we carry out on your behalf to prevent this happening. So whilst they are a little more expensive, you can be more confident of harvesting onions you can be proud of! 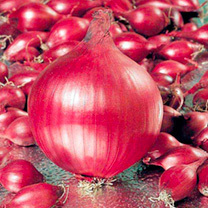 200g of onion sets (approximately 50 sets) will plant a row of about 5m (16'). Full growing instructions included.